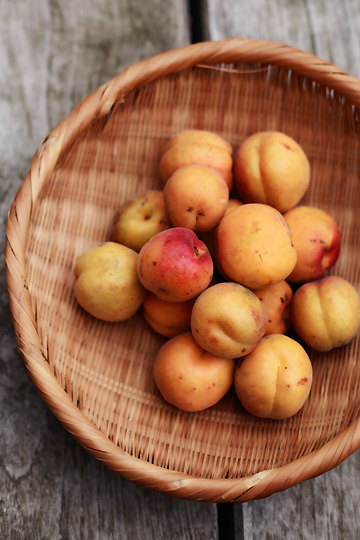 A few summers ago, I decided to pick up a basket of fresh apricots at the store in hope of turning them into something enjoyable, and that, by doing so, I would somehow come to enjoy the fruit. I did reasonably well, I think, at least in the dessert making part. Whether it was good enough for me to really start liking apricots, well, that was another story. As I confessed back then, apricots aren't my most favorite fruit. One of the least, actually - either fresh or cooked. Dried apricots are alright, only if they are used along with other dried fruits, not just apricots alone. I don't hate them, mind you, but it's just not what I'd reach for among other fruits, especially when they are just one of the many stone fruits that come around in early summer, such as cherries, peaches, and plums, all of which I love. I'm not sure if many people have the same sentiments, but in Japan apricots aren't exactly common, especially fresh. You'd see fresh peaches or cherries dominating the store shelves at supermarkets and green grocer's everywhere, but never apricots. They have a very short season, and it is easy to miss them as they make a brief, low-key appearance, if at all, at the stores in Tokyo. Also, they are almost always fairly expensive; even if you do notice them at the store, chances are you'd pass them up, unless you are positively partial to them. Which I'm not. But this year was different for me. It must have been because I was (and still am) in Nagano, where about a half, perhaps more, of the apricots grown in Japan come from. While apparently apricots may not be as common as they once were (as locals told me, "there used to be apricot trees everywhere"), the fruit still have a grander presence around here, and is considerably cheaper. So in early July, when I found heaps of apricots at a local supermarket for the first time in the season, I popped a couple of large baskets in my cart. The simple fact that I was in one of the few apricot-growing areas in the country, right in the middle of its season, seemed to justify my impulse purchase. I might not have liked them, but I intended to try and do something with them, although I wasn't sure what. Plus, I knew my mother would use them if I didn't; she likes to make liquors and jams with local produce, and in fact, apricots could be the only thing she says would bother to buy for her homemade food/beverage projects (she normally uses crops from their own vegetable patches or orchards, or else given by her local friends). Turned out, that was what I, too, did with my apricots, after leaving them sitting on the counter for a good part of the week that followed, not feeling inspired. I threw some ripe apricots into a glass jar along with sugar, and poured some brandy in an attempt to make my own Apricot Brandy. I know I've just said I don't like apricots in any form, but I happen to enjoy apricot liquors. Let's just say life is complicated. As you might have guessed from the picture above, I also did a batch with cherries, why, for Cherry Brandy. Not that they were locally-grown, unfortunately (they actually flew all the way from the US; we have pink cherries grown in Japan, but not the dark kinds), but they come into season at the same time as apricots, and unlike the latter, cherries are very popular and abundant. 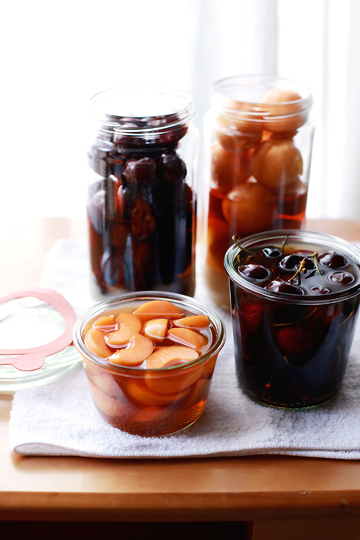 I followed this recipe for apricot brandy, and did the same with cherries. Except I used regular, cheapish brandy rather than vodka - believe it or not, but vodkas sold here aren't exactly cheap. I also decided to add more brandy (and sugar) relative to the fruits than specified. I couldn't help it, for almost every homemade liquor recipe in Japanese tells you to make sure your fruits are entirely submerged in the spirit, although in the said recipe it seemed okay if they aren't. We'll see. I only made small batches of brandies, and was left with still more of the fruits as well as brandy. So I decided to made something else - using the same fruits, brandy, and sugar. Brandied Apricots and Cherries. 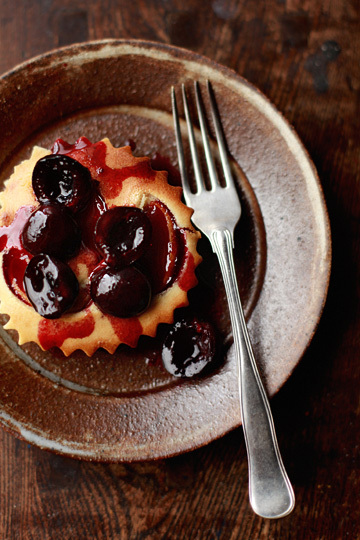 These were based on a recipe for brandied cherries in the lovely book My Favourite Ingredients (Quadrille Publishing, 2008) by Skye Gyngell, the head chef at the famed cafe restaurant at Petersham Nurseries in Richmond, London. It's also a simple recipe, but here you'll need an extra step of warming the brandy with sugar and some water before adding it to the fresh fruit. But that's about it. All you need now is to wait for a week or so for the fruits to steep in the liquor mixture until they are nicely boozy. The recipes tells you to use the cherries with the pits and stems left on, which I did. But I quartered and stoned my apricots, just to make them small so they would be ready to use when the cherries are. I think I could have added the kernels, but not sure. 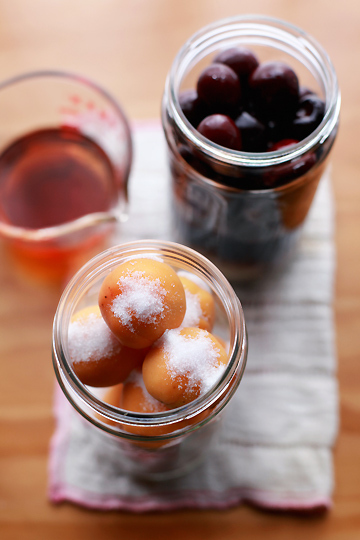 Again, I ended up adding more brandy and sugar in the jars, for this recipe does tell you to make sure the fruits are entirely covered, which mine weren't. Oh well. Now in case some of you wondered what the differences are between the fruit brandy and brandied fruit, I take it that it is a matter of what you ultimately want: liquor or fruit. 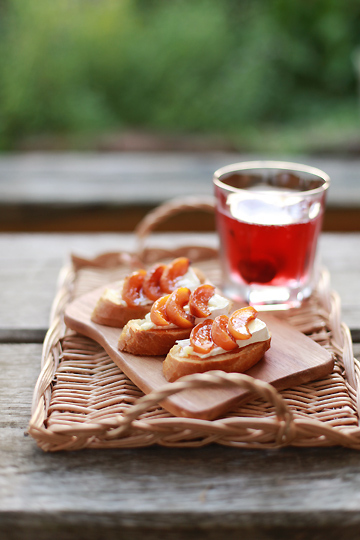 For the home-made fruit brandy, the fruit you use would often be unpalatable, if not inedible, by the end of the months of steeping process during which its flavor seeps into the liquor. With brandied fruits, on the other hand, you want to eat the fruits infused with the liquor; the steeping liquor is just a byproduct, although it will be good to use, lightly flavored with fruit and usually sweet. 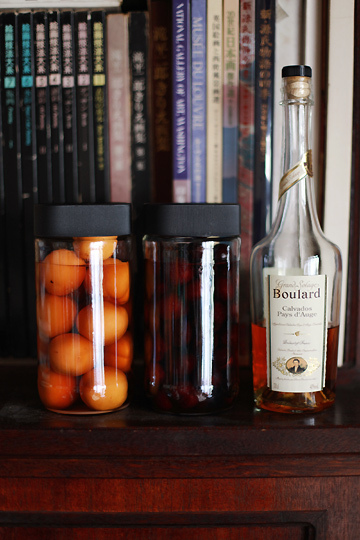 So my jars of fruit brandies were placed on a bookshelf so I wouldn't forget to flip them over every day (as required in the recipe), while the brandied fruits were stowed in a dark, cool cabinet. The brandies will be bottled after three months of steeping, and the fruits should be ready in about a week. I felt like I'd put my impulse buy to good use. 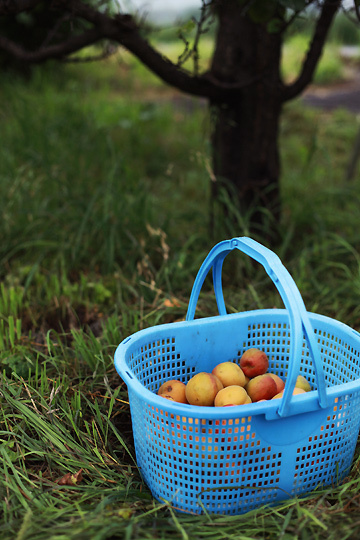 Then, a few days after in mid July, I found myself going out to pick apricots. A friend of my mother's has an apricot tree in their backyard, and they would give mom their apricots almost every year, she'd told me. And this year, they hadn't called her to come over to pick them until after we bought our first apricots, but she went, all the same - and I tagged along. Well, you might wonder why I'd bother to go out for something I don't even like. But I must say there is something about picking fruits on your own; the experience itself is fun. Aldo, I'd never seen an apricot tree bearing fruits, so I was curious. 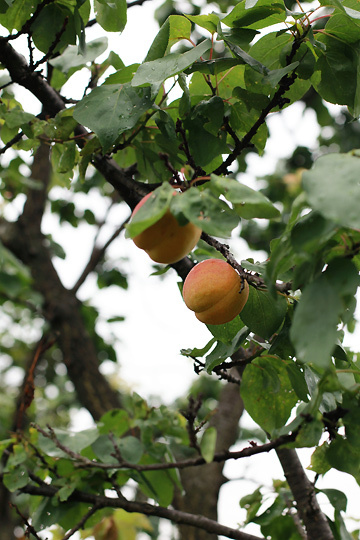 So off we drove a few miles on one muggy, rainy morning to their house, where they had trees of not only apricot but peaches, Japanese pears, kiwi fruits, and pomegranate. And a lot of walnut trees - they in fact grow the nuts to sell! They gave us a large bag full of walnuts, and in addition, I managed to pick some young, green walnuts to make something special... now I'm anxiously waiting for my batch to be ready! Back to apricots: it was towards the end of the season, and they kindly encouraged us to take all that was left on the tree, which we did. Talk about greedy, I know. 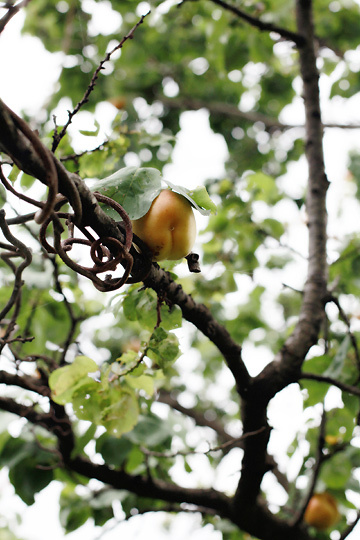 The tree was large, but at first sight it looked like there weren't much fruits left on - maybe just a dozen or so. However, once we plucked most of them (there were inevitably some left at the very top of the tree, out of our reach even from on the top of the ladder), our large basket was halfway full - there were certainly more than a dozen! In addition, they had picked up all the really ripe fruits that had fallen off the tree earlier in that morning, and ever so generously shared them with us. The ones on the tree were mostly ripe, but those fresh-(fallen-)off-the-tree were extra ripe, soft, and fragrant. And in case you wondered, they said they'd pick up such fruits every morning, so it was guaranteed that they had been on the ground for less than 24 hours. So we weren't worried about that. Back home with our bounty, still excited, I took a shot and had a bite of one of the extra-ripe apricots. Which was... well, not bad, to be fair. But not great, either, and it reminded me exactly why I didn't care for apricots: they are not particularly sweet, tart, succulent, or aromatic. In other words, apricots are a little too bland to my liking. Still, I was happy about our large stock of extra-fresh apricots, and was all for making good use of them. The first thing I made was meant to be a thank-you gift for the family who so generously shared their fruits with us. I wanted to use their apricots, naturally, and might as well the walnuts. Then, I remembered that my mother had been saying for a while that she'd like "that crunchy walnut cake" I used to make - linzertorte. Linzertorte, or Linzer torte, is made with a cookie-like dough loaded with nuts (often almonds or hazelnuts), and raspberry or currant jam. The one she remembered was a version using walnuts, finely chopped rather than ground, which gave the cake a definite crunch. Trouble is, I still own the book that has the recipe somewhere, but don't know where. I once tried and made her another version of Linzertorte using fresh berries a few summers ago while staying in Nagano, in hope of recreating the one we'd loved. It didn't come out as I had wished. So this time I searched up the Internet for a bunch of Linzertorte recipes, and eventually settled on one. Starting from there, I made a few tweaks, replacing almonds with walnuts (chopped, not ground), increasing the amount of flour a bit, piping the dough rather than rolling out, and most importantly, using fresh apricots instead of jam. I know apricots aren't alike raspberries or currants, but they are all tart fruits, so that should do a trick, I decided. I sliced up several apricots and tossed them in a bit of sugar. I spread half the dough (more like batter, considering how soft it was) over a pan, smeared with a bit of apricot jam, sprinkled with a bit of corn starch, then topped with the apricot slices, drained the liquid off. Then, on a whim, I sprinkled some fresh blueberries (given by another friend of mom's, also from their own garden) before finishing with the remaining dough. That was when I realized I didn't have enough dough left to make a lattice top, which is one feature of traditional Linzertorte. At this point, it was too late for me to re-assemble the cake all over again, so I just went with what I had left by doing what I could do: making it stripe instead of lattice! 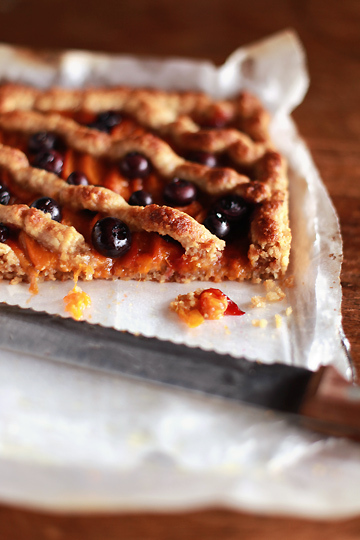 So, here is my Walnut Linzertorte with Fresh Apricots and Blueberries. Admittedly, I forgot to sift confectioner's sugar over for a finishing touch, but I think the stripe-top actually worked well, exposing the orange-blue contrast of the fruit filling more nicely than a lattice-top would have. The texture of the cake was spot-on, winning mother's two-thumbs up. Apricots turned out really juicy and slightly jammy, and the not-too-sweet filling overall paired really well with the rich cake with a hint of spices. It was a lot of work shelling AND removing the wafer-thin skin off the walnuts (and a lot of them! ), but I wouldn't mind making it again. Now the Linzertorte didn't make much of a dent in our stock of apricots, that were rapidly ripening in a corner of the room. While I was being busy and not able to work much in the kitchen, mother took action. Other than for homemade liquor, she often uses the fruit to make Apricot Sauce. Here fresh apricots are simply pitted and chopped, and stewed until the flesh softens and collapses. Then some sugar, not much, was added to it, before finishing it by cooking briefly further until the mixture is slightly thickened. She doesn't purees it in the blender, or passes it through a sieve, although you could, if you'd like to, of course. It's not too thick and not too sweet - she normally eat it over her bowl of yogurt, also home-made. This time she made a large pot full of the stuff, so I nicked a few ladlefulls into a small pot and cooked it down further, to turn it into apricot "jam", which I wanted to use for something else. Pictured above are the jam and the sauce - I think you can tell the difference between the two, both in color (darker for the jam) and consistency (thicker). And it happened when I was making the jam; when I took the lid off the pot of apricot sauce sitting atop the kitchen counter, a sweet, musky scent tickled my nostrils - to my surprise and delight. One taste, the sauce was not really sweet but quite tart, yet quite vibrant. It seemed that the cooking brings out the flavor of apricots, intensifying both the scent and tartness. I was surprised to find myself actually liking it. 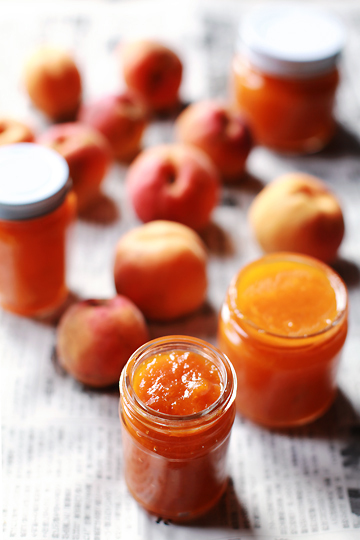 Suddenly inspired, I set myself to work with apricots - and I started with what I had at the ready: mom's apricot sauce. Take a cup or so of the apricot sauce, mix it with a cup of heavy cream (lightly whipped), and a dash of brandy and freeze to let it harden. Break it into pieces, put in a blender (or food processor) and process until smooth. Taste, and add some sugar if necessary, before putting the mixture back to the freezer. There you have simple Apricot Ice Cream, quick and easy to make, even more so if you have the apricot sauce ready. 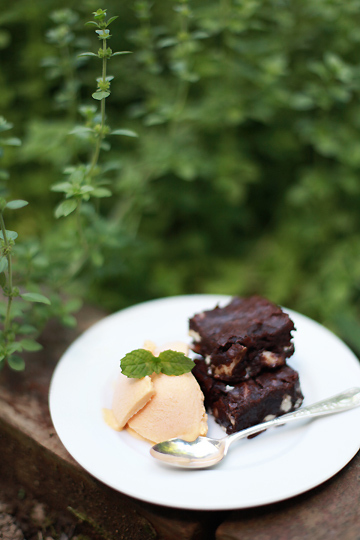 Here I served it with mint brownies with almonds and white chocolate chunks, but the ice cream was great on its own. This juicy Apricot and Blackberry Tart was the first recipe I tried from Good to the Grain: Baking with Whole-Grain Flours by Kim Boyce (Stewart, Tabori & Chang, 2010), though the recipe uses boysenberries (which I can't find around here) rather than blackberries. I'm basically a lazy baker who can hardly ever be bothered to make something as elaborate as tarts and pies (yes, I'm that lazy), but this one caught my eye as I flipped through the book and I just couldn't help but try it. And it was quite manageable - fun, even. Apricots were from my mother's friend, while blackberries were from her backyard here, although they were frozen from last summer; they aren't yet ready this year. The both fruits were tossed in some apricot jam (homemade - this is what I'd wanted to make my own jam for) and gently wrapped in the tart dough made using rye flour. I halved the recipe, which makes two large tarts - and made two smaller tarts. I baked one of the tarts when we had our family over, as a dessert after lunch. 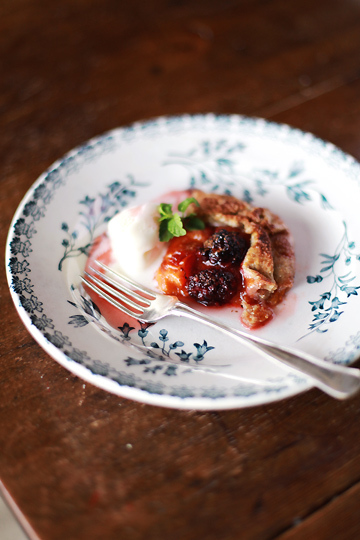 Served still warm, with some ice cream and sorbet (vanilla ice cream here), the tart sang of summer. Cherry, Apricot, and Almond Cobbler from Ready for Dessert: My Best Recipes (Ten Speed Press, 2010), the latest book by David Lebovitz. This also caught my attention, for a few reasons; I love all sorts of crumbles and cobblers, and yet I had never tried one that uses almond paste in the topping. And well, yes, I wanted to make something that uses apricots. And I was glad I did. The topping was sweet and extra flavorful thanks to the nuts, and almonds go beautifully with both cherries and apricots. 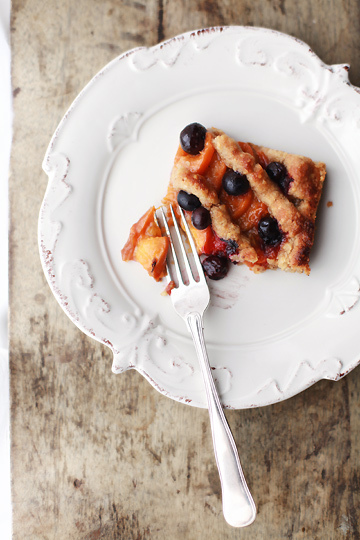 This was originally a recipe for cherry cobbler, and the use of apricots in combination with cherries was among the variations suggested in the book. While I'm sure it would taste lovely with cherries alone, I found the tartness of apricots added a nice contrast to the sweet Bing cherries. Clafoutis isn't really something I make a lot - the egginess of it tends to put me off. But this one was quite tasty, probably thanks to the use of almond and cream in the batter. Apricot played its part, again, by giving a pleasant tartness to the otherwise really rich and sweet dessert. 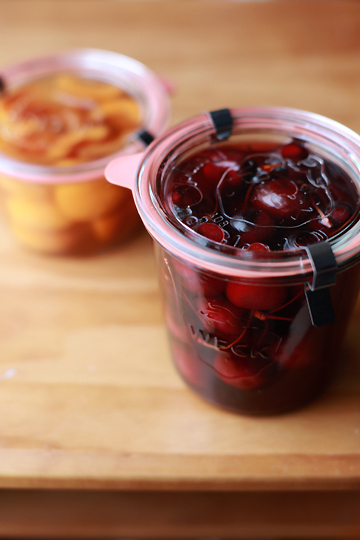 I must say that the combination of cherries and apricots really won me over by now; there is something about the two together, the way their flavors complement each other. Well, you probably don't need me to tell you this, considering how many recipes there are that combine the two. But still. They had sat for almost two weeks before I took them out of the cabinet. 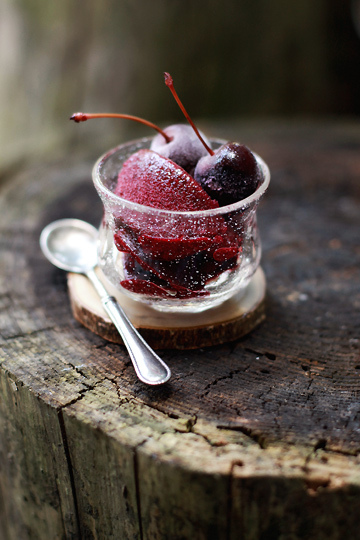 For the cherries, the brandy syrup has turned garnet, having taken on the color of the fruits. Apricots, on the other hand, seemed to have turned only slightly darker, leaving the syrup with a light shade of honey. 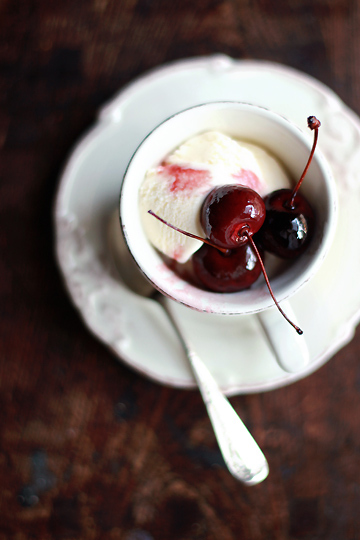 Vanilla Ice Cream with Sauteed Brandied Cherries; you sautee the cherries along with the syrup and a nob of butter, and serve it warm over vanilla ice cream. I must admit I used mediocre, store-bought ice cream here, but even so - or perhaps because of it - the deeply aromatic cherries turned the humble ice cream into a small dessert of a sophisticated taste. Grilled Fresh Apricots with Brandied Cherries and Sweetened Mascarpone, which was, well, what the name says it is. Apricots here were fresh, and not the brandied - it would have made the whole thing over the top? I don't know. 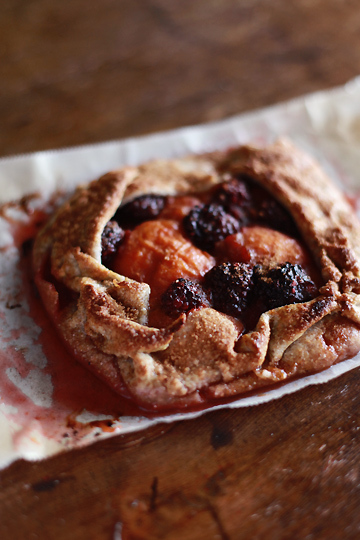 But this was such a simple but rich dessert without an extra brandy-soaked fruit involved, and it definitely needed the tart apricot to cut the richness of the brandied cherries and fatty cheese. The brandied apricots, meanwhile, ended up being used mostly cooked; even when soaked in brandy, it still tasted a little too bland to me. I really need my apricots cooked, it seems. I popped a few quarters of the apricots with a lot of the syrup, as well as a bit of honey, and cooked until the syrup was reduced and thickened. I spooned this over some yogurt that had been drained over a strainer to thicken it (you could use Greek-style yogurt if you can get it - I can't here), and topped off with some chopped pistachios. 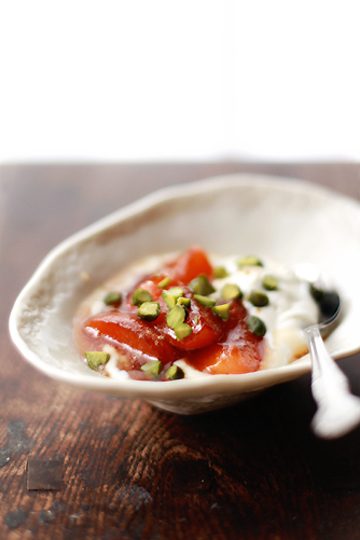 Hence Thickened Yogurt with Honey-poached Brandied Apricots with Pistachios; I first thought of something like apricot compotes with yogurt, a kind of thing you'd have for breakfast. Except brandied apricots wouldn't exactly be suitable to serve in the morning, so this would be more of a late afternoon treat. Then again, if cooked thoroughly, they could make a breakfast dish, perhaps? 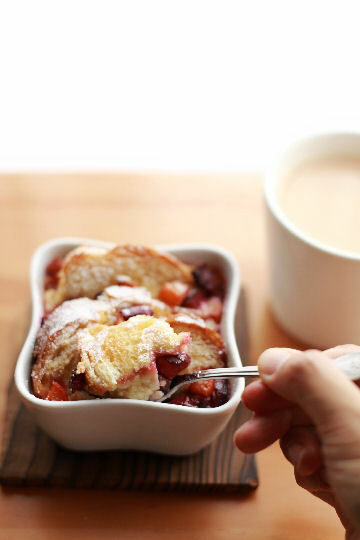 Bread Pudding with Cherries and Brandied Apricots; excuse me for getting rather repetitive here with my overuse of cherries and apricots together, but they both happened to be around in the fridge and I couldn't help it. Here apricots were brandied but cherries weren't - I suppose you could use both the brandied fruits if you like. The bread pudding itself was fairly simple but rich with a lot of cream in it, and quite honestly, you really can't go wrong with something so simple. Slice and roast (or grill) the brandied apricots, and arrange them on toasted slices of bread thinly spread with apricot jam and topped with a slice of brie. 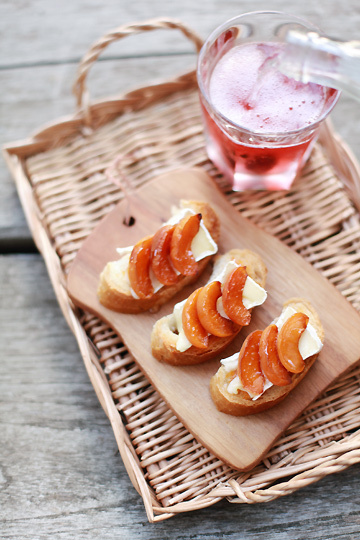 There you have Roasted Brandied Apricots and Brie on Toast, a simple accompaniment to your choice of drink. My choice here was Brandied Cherry Soda - the brandied cherries and its syrup topped with sparkling water. 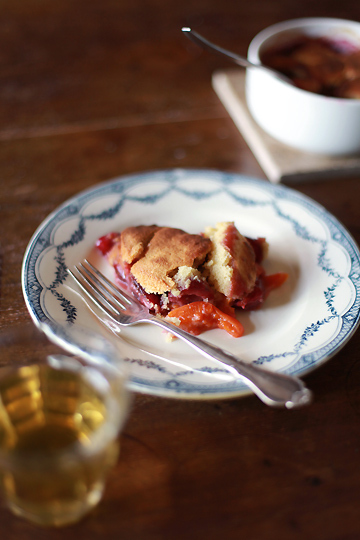 This turned out to be a wonderful use of the brandy syrup, the byproduct of brandied fruits. Mother confessed that she'd prefer to drink the brandy syrup just as is, but I found the soda irresistibly cool and refreshing - perfect for summer. 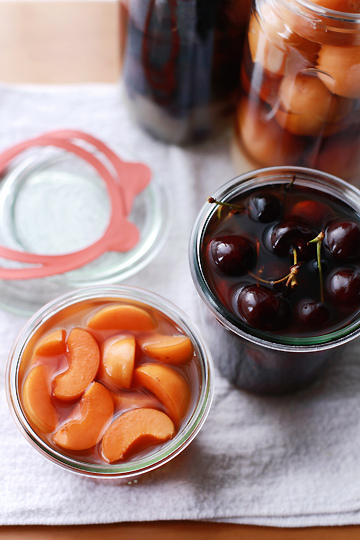 Either way, apricots and cherries both produced lovely syrup, and this left us feeling even more hopeful about our fruit brandies that would be ready to drink later this year. I mean, if the liquid tasted so good after only a couple of weeks of infusing, how wonderful it would be after months? And yet, as much as the syrup tasted good, the real star here, of course, was the brandied fruits - well at least in the case of cherries. 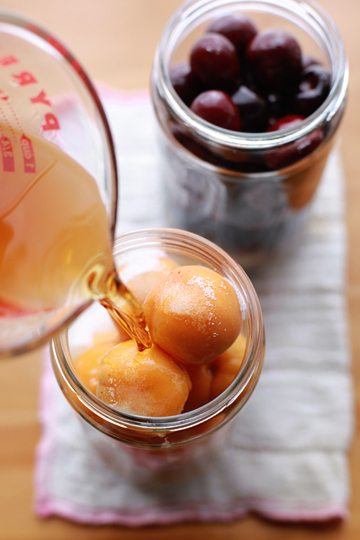 Soaked in the brandy syrup for two weeks, the cherries had thoroughly absorbed the aroma of brandy, but still retained its crunch and flavor, turning into extra fresh, booze candy. We couldn't resist nibbling on them as is, one after another. Then mom suggested we freeze them, which proved to be even better. Because they have absorbed so much alcohol, they don't turn rock solid even overnight in the freezer. Instead, they stayed fairly soft but icy cold. Best kind of ice candy for grown-ups! 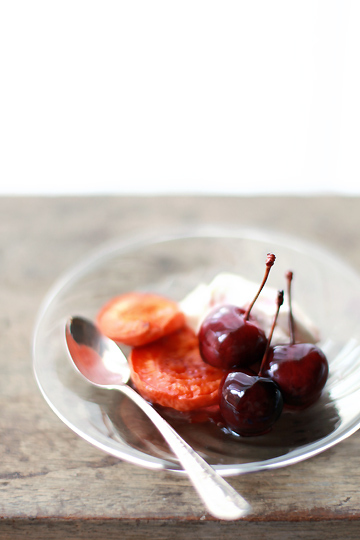 Here I had my Icy Brandied Cherries with Simple Cherry Sorbet, another recipe of David Lebovitz I found in Ready for Dessert. When he said "simple", he must really have meant it, for it really was very simple to make. Basically, all you need is to poach a lot of pitted fresh cherries with some sugar and water, freeze the whole thing - cherries and syrup and all - then process in the food processor (blender in my case). That's about it. You are essentially eating cherries in syrup, frozen - only it was far better than what it may sound; icy cold, smooth, and bursting with flavor of fresh cherries. The stunning shade of deep purple gave it a visual appeal, too. Apricot wasn't the primary element, strictly speaking, of this dessert. But it was more than a mere topping for sure. I made this Matcha and White Chocolate Mousse with Apricot Sauce, inspired by a dessert I'd found in one of my old Japanese dessert books. It was a dessert that consisted of apricot mousse layered with matcha sponge, and although green tea and apricot may not be the most common combination, they worked really well, I remembered. 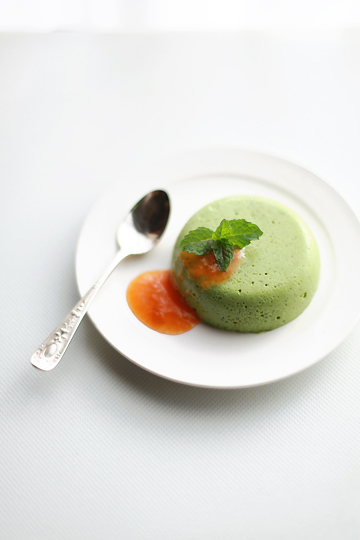 Here, I was initially going to make simple and easy matcha pannna cotta (did I tell you I'm a lazy baker? ), but thought a richer, custardy mousse (using eggs) might pair well with the tart apricot sauce. I used this recipe (in Japanese) for the most part, and melted in some white chocolate for a good measure. The result was this light, creamy, melt-in-your-mouth mousse with the mouth-puckering sauce. 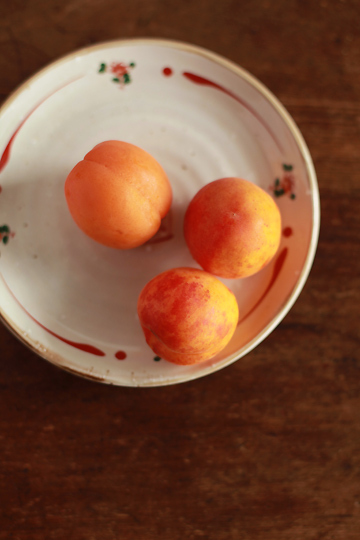 Matcha desserts often come with berries, such as strawberries and raspberries, but here apricots provided the fresh tartness, perhaps a little more assertive one. 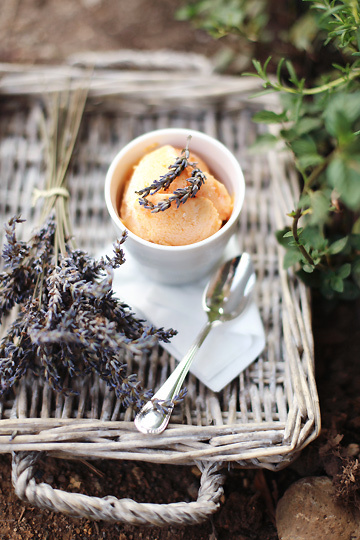 Apricot and Lavender Ice Cream. I've been making honey-sweetened, eggless ice creams (with no ice cream maker involved) a lot for the past few years, and already churned up several batches this summer. Here, I cooked some fresh apricots with honey until soft, and added some lavender flowers and left the mixture sit overnight in the fridge, before combining it with lightly whipped heavy cream and a little more honey and freezing the whole thing. I've said apricots aren't my favorite, and neither is lavender; even so, I've found more than a few recipes that combine them, so I figured they would make a good pair. I aimed for subtlety; just a few flowers seemed to have done the trick. (And the flower sitting atop the cup of ice cream in the picture was completely unnecessary as far as my taste was concerned, but just so you can guess what's in there!) This probably wasn't the best ice cream flavor I've ever had, but it was very pleasant - a lot more so than I'd expected. It has taken me a whole month of intensely working with (and eating) baskets after baskets of ripe apricots to start liking the fruit. Wow, did I just say I like apricots? Maybe it's a bit of overstatement, just yet, and I still like peaches and nectarines a lot better than apricots in every way. But I think I have started learning to enjoy this long underrated (at least by me) stone fruit. Slowly, a little by little. I don't know if or when I'll ever love them, but what I know now is that I much prefer them cooked, which is interesting given I prefer most of the fruits fresh, as is. 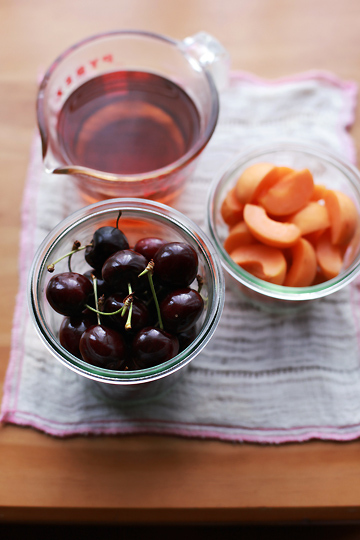 Also, I seem to enjoy apricots better when paired with other fruits, particularly cherries. You could perhaps say I'm just fooling myself by using such "other fruits" like cherries to mask the flavor of apricots, but I have come to realize, and appreciate, how apricots complement these sweeter fruits. At any rate, it would be a good thing to have one more thing to look forward to in the summer. Or should I say, one more thing to wait for anxiously? The apricot season is such a fleeting affair after all, and it's too easy to miss them if I'm not watchful. Let's see if I make it next year, if I can find more ways to truly enjoy them. Failing that, I'd just have to ask mother to send me a few jars of her apricot sauce, just so I can relive the intoxicating smell that almost got me hooked on apricots. Glad you liked the cobbler. Apricots rock! Enjoy 'em while they last.. Thanks David - you rock!! How lucky that you had so many good apricots available to you. Here it is hit or miss and they are usually sour and very expensive. Lovely post! I love love love your photos. fruit is so peacefully simple and beautiful - and fun to cook with even if you don't really like it. i wasn't an apricot fan til last week. i have been playing with cases of cherries, apricots and peaches the last 2 days canning for the first time (blog post to come pronto). just had pizza with bbq sauce, peaches and arugula. yum! thanks for being so inspiring. 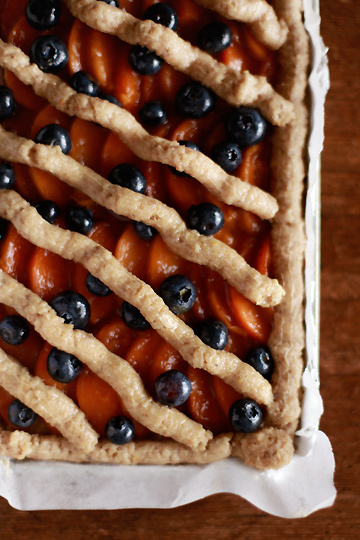 Great pictures and some great uses of your apricots (and cherries)! Photos are amazing, and are making me drool! I actually really love apricots, but I haven't eaten them for a pretty long time. For those who don't care for apricots, the truth is you just haven't had a decent apricot. 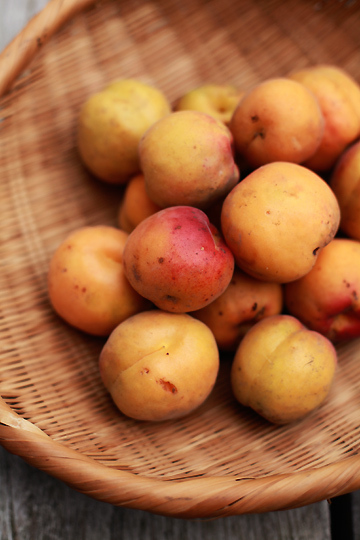 Most types of apricots are beautiful but have very little flavor. In California the only type worth eating is the Blenheim, which unfortunately can no longer be found in supermarkets. Those of us in the greater San Francisco area are lucky because we can find them for a short time every year at farmers markets. If you ever see Blenheim apricots, buy them! Oh my, Chika, girl, another breathtaking post. Beautiful, beautiful, beautiful in every aspect. I am in awe of every single photo you take. Never thought of preserving fruit in brandy, but I love the idea and how you've given us so many ideas for what to do with the end product. I look forward to your every post :). Really enjoyed this post and looking at your fabulous pictures!! We love to preserve fruit in this home too and it's great to see others share in this passion. We're having the most flavorful apricots I can remember in years, so I might recreate some of your fab ideas. Just don't know where to start, they all look fantastic! I always leave this comment, your photography just rocks! It is always such an inspiration, it's clean, simple, really showcases the food, the quality of the ingredients, and I want to eat everything you post about! Dragana - it's about the same in many places here, including tokyo. i really was being lucky to get a hold of good ones. i love how you explored the many ways to enjoy just one fruit! Sadly, the only apricots and cherries I'll ever get will be from the super-market, but I can still try and brandy them...must bookmark your post. Wow, everything looks delicious! Cherries are my favourite fruit, but like you, I came to appreciate apricots much later in life. Recently my mum's been soaking raisins in rum to eat with vanilla ice cream. I just eat them on their own. Your photographs are beautiful! And everything looks so good, I want to try it all!! I loved this post! Everything looks so yummy! I am a lover of apricots and I look forward to making your mother's apricot sauce. Thank you for taking the time to be so thorough and offering so many different recipes and gorgeous photos.